Presidents' Messages: To begin 2008, both Warren and Ken wish a Happy New Year to all and look forward to seeing you at the General Meeting on January 22. How time flies when you're having fun! The past two years have gone very quickly and productively for me. Some things that should be a priority for 2008 are to work on a permanent home for the Society with the help of the Fair Oaks Recreation and Park District. Next, we could have another fundraiser AND the repeat of the Soup Night. It is already scheduled for 11-08-08. Lastly, over the year, we hope to involve more of the membership with Society activities. 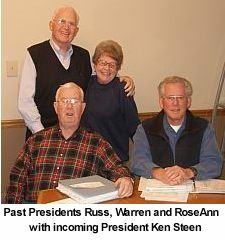 I will be turning over the Presidency to Ken Steen at the January meeting. Keep in mind to help him in any way that he might ask you! Continuing to improve the History Center and, eventually, securing a permanent site. Using media and technology such as our WEB site to share the Fair Oaks story. Coordinating with other history centers. Involving more members in the work of the Society to benefit from their knowledge and abilities. Reminder on dues: Payable for the 2008 year beginning January 1st. Vice-President's Message: Program:. Happy New Year! 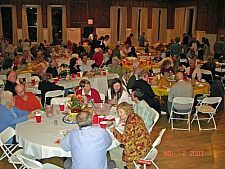 It is that time of year again for the Fair Oaks Historical Society’s annual potpourri program. The topic will be “My Favorite Toy.” Everyone, please bring your Favorite Toy to put on display. If you have a story to tell about your toy, please contact me at 944-4812 and I will put you on the January program. Your presentation can be between two to four minutes. I'm looking forward to a fun program of our sharing favorite toys with friends at the Fair Oaks Historical Society. A Recap of October 2007’s Program: A big thank you goes to Ruth Stilwelll and the Roseville Ramblers for stepping in on short notice for our October 2007 program. 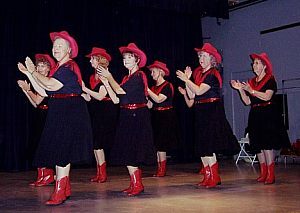 Ruth and her dance group entertained the Fair Oaks Historical Society with a number of line dances. The Roseville Ramblers are a mature group of women in their prime that enjoy dancing and entertaining while getting their exercise. They showed us all that there is no end to how much fun you can have with your friends. If you ever have an opportunity to see one of their performances, you will greatly enjoy it. Tentative Programs for 2008: April’s program will be on the history of one of Fair Oaks’ oldest buildings in town. July’s program will be on the history of Bella Vista High School and its first graduating class of 1963. October’s program will be a presentation on the history of one of Fair Oaks’ neighboring communities. If you have an idea or suggestion for a future program topic, please let me know. I want to bring historical topics of interest to all of you. You can call me at (916) 944-4812 or e-mail me at sherrywood1949@yahoo.com. SOUP NIGHT a SAVORY SUCCESS! 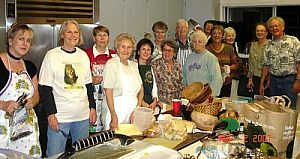 Soup Night, November 2, at the Fair Oaks Community Clubhouse served as our first fundraiser toward a permanent Fair Oaks History Center. The Society was thrilled with the turnout, ambience and near $6,000.00 profit toward their goal. Maria Brugger led this effort with great teamwork and donations from society members. Guests selected their dinner meal with as many as four delicious soups, a take-home ceramic bowl, salad, bread, beverages and dessert. The committee is ready to do it again! Lynn Steen and Claudia Thorn have offered to chair the event. Maria is ready to manage those wonderful soups. Your participation in the event would be greatly appreciated as well. PLEASE save the date of Friday, November 8 in 2008 for a great meal and financially moving closer to better history center housing! 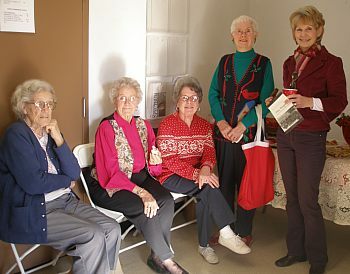 Our annual open house at the History Center was attended by approximately 36 people on December 9. 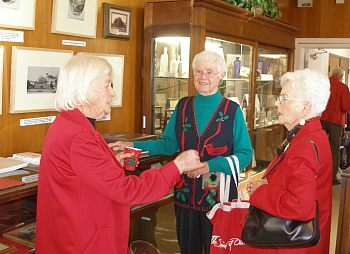 Members and visitors enjoyed cookies, punch and hot cider. Thanks to all who donated cookies. On January 6, the History Center was open for visitors in conjunction with the American Theatre Organ Society special concert by Eric Fricke.The organ is permanently located in the Commumity Club House auditorium. The following people have been docents this year. Appreciation goes to Diana Lennon, Lois Frazier, Margurite Goddard, Fran Sargent, Larry & Meg Smart, Gordon & JoAn Heidt, Bonnie Cranston, Lillian Jones and Lucy Strom. The History Center is open every 2nd Sunday of the month from 1:00 to 4:00 pm. Our new location is in the center of the Village in the Community Club House Fireside Room. We have a new large banner and "OPEN" History Center sign to attract Sunday visitors. Wouldn't you like to be a docent? Call Lois at 967-2967. Our Memorial Book is a very significant way to remember the departed. Names are inscribed in the "Book" that is on permanent display at the History Center. Forms are available at the Center or call Meg Smart at 967-6590. Sherry Wood introduced the Roseville Ramblers, a group of eight senior lady dancers, who entertained us while we were finishing dinner. 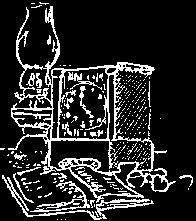 The meeting was called to order by President Warren McWilliams at 7:15 p.m.
President’s Remarks: Warren’s message for the evening was “Soup Dinner,” we need to sell tickets and support our first attempt at fund raising. Minutes: The minutes were approved as duplicated. Treasurer’s Report: Our checking balance is $5,937. 05. Our savings account balance is $14,866.68. Vice-president: Sherry Wood reported that we received a royalty check for $213, she also reminded us that we have more books to sell. History Center Operations: Lois reported on a Bat Boy uniform donated by Bill Hinsey. It is currently being displayed in the history center. She reminded us that the History Center is open every second Sunday, and there will be a Holiday Open House on December 9. Website Coordinator: Diana Lennon and Jim Pearce reported on a list of projects that need to be completed, sign-up sheets were distributed. Historical Remarks: Bob Brugger reported on our beautiful river. Our river has been named seven times, these different names were all recorded on early maps. John Fremont named it the Rio do los Americos, John Sutter shortened the name to American River. The Indians called the river Natoma. Nominating Committee: Diana Lennon, chairman of the nominating committee reported the slate of officers for 2008: President, Ken Steen; Vice-President, Sherry Wood’ Treasurer, Joe Dobrowolski; and Secretary, Janet McWilliams. Lois Frazier moved that we elect the slate, motion seconded by Pat Vogel.. Motion passed. 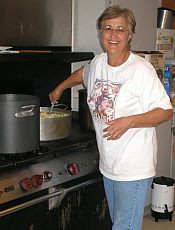 Soup Night: Maria Brugger reported that the committee has been working hard. We need to really get behind the event. Meeting adjourned after the raffle. Note: The minutes of the Oct. General Meeting are included here and will not be passed out at the 1/22 meeting. Present Owners: Jenny and Nazra Bertelli and children Alanah, Ricky and Lumina who have moved out after 7 years. They are selling the home by owner at 903-7603 with an asking price of $515,000. Our only known photo of the Shirvin House was on a postcard in the Iva Langness collection of photos. On the back of the post card was the notation, "Shervin [sic] home on Hill St, about 1912, Abbey Green." There is no date on the postcard. Jim and Marilyn Pearce went walking on Hill Street with the old photo and found the home, little changed since the photo was taken. If Abbey's notation of "1912" refers to when the house was built, it was probably built by William H. Williams who came out to Fair Oaks in the early 1900's from Illinois, probably to retire since he was in his late 50's or early 60's. His trade was a butcher. While the property (Block 17, Lot 2 on the property maps) had several owners before being bought by Mr. Williams, there is no evidence it was built on before 1907. Mr. Williams is listed on the property records for 1912 as the owner and shows up in the 1910 & 1920 census living on the property. The Shirvens moved to Fair Oaks from Minnesota around 1925 and bought the house. Daniel Shirven also probably moved to Fair Oaks for retirement since he was about 72 years old. His first wife died in 1916 and he married his second wife Hedwig, some 27 years younger, in 1920. They had no children. Tempe Weinreich, owner of our featured home last issue, had Mrs. Shirvin as a teacher at Fair Oaks Elementary in 3rd., 4th. and 5th. grades. She remembers her as eccentric and beloved who taught there a long time. Her driving skills however were notorious as she was absent-minded and careless. Some time after Daniel died, she married Peter Thrall. They are buried in Fair Oaks Cemetery. 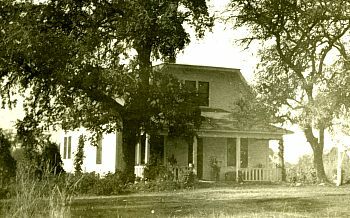 Viola Snyder lived in the home at one time and later bought the lot next door for her long- time home. She passed away in 2006. Many renters lived there until the present owners took over. Jenny is owner of Belinda's Maid Agency, a business in our Fair Oaks Village, and has appreciated the home as it was close to school and work. The home has 3 bedrooms, 1 1/2 baths downstairs, living room and office area. It has no basement but a deep crawl-space. 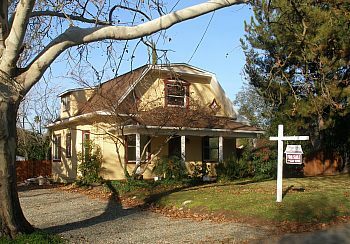 It is situated on under 1/4 acre. It had dual-pane windows when they bought it and a bit of metal roof...probably original. They recently had it repainted inside and out! "I'm currently in the research stages of writing Max's biography. I'm generally aware of the decades both Max and Ancil spent in Fair Oaks and Sacramento. But it occured to me, that I can't write a biography of true depth without information on what kind of people both men were away from the spotlight.....Is it possible that someone within your Society knew Max or Ancil, or knows someone who did and would wish to speak to me ? " Surely we have some old timers who knew these people in Fair Oaks and can contribute to Catherine's efforts. Please contact Jim or Marilyn Pearce if you can help.